Located in Lee County, Opelika and Auburn are both situated on Alabama’s eastern border with Georgia. With the first white settlers arriving in the late 1830s, Opelika soon became a commercial center with the coming of the railroad. In 1848, the Montgomery & West Point Railroad Company extended a rail line from Montgomery to Opelika. In 1851 the railroad completed a line to West Point, Georgia, which then connected Opelika to Atlanta. This line became one of the primary trade routes for shipments of raw cotton from southern plantations to the North. The Montgomery & West Point was soon joined by a rail connection to Columbus, Georgia in 1855 and a connection to Birmingham in 1869. With these new rail connections, Opelika rapidly became a regional hub for commerce. Opelika was incorporated as a town in 1854. Due to its transportation infrastructure, many warehouses for storing cotton and other goods were built in the town. These warehouses were converted to Confederate supply depots once the Civil War began. In the years between 1870 and 1890, Opelika garnered a reputation as a lawless town, as it was home to several saloons and frequent gun fights. In 1900, local investors founded the Opelika Cotton Mill as the first textile plant in the city. Opelika’s textile industry continued to expand for the next several decades. The period between 1930 and 1970 was Opelika’s heyday, as industrial growth turned the town into a regional economic center. The Jewish community in Opelika began in the 19th century, and continues today. The first Jewish families to settle in Opelika contributed to the economic growth by opening dry goods businesses. The Blumenfeld and Kahn families had arrived in Opelika by 1870. Moses Lemle and his nephews Isidor and Herman Weil came to Opelika sometime before 1874. The Weils were cotton buyers and began the Weil Brothers Cotton Company, which eventually moved to Montgomery, Alabama. The Fleisher and Hagedorn families also owned stores in Opelika. The A.B. Fleisher Dry Goods Store remained in business in Opelika for 81 years until it closed in 1985. Opelika was an ideal location for the Jewish merchant because railroads allowed the transportation of merchandise between Alabama and New York. Julius Solomon Hagedorn arrived in Opelika in 1917 and bought out the store H. Blumenfeld’s, changing the name to “Hagedorn’s.” The store remained in the Hagedorn family until it closed in 1976. Julius Hagedorn was known for his business achievement and helping with the growth and development of Opelika’s economy. He was also civically active as the president of the Opelika Chamber of Commerce and the Kiwanis Club. Hagedorn’s bargain basement attracted a mostly African American clientele and he was well liked by the black community of Opelika. Despite this positive business relationship, there was little social interaction between blacks and Jews in Opelika, as Jews were careful not to challenge the status quo of segregation directly. In 1937, Hagedorn rescued his family still living in Westphalia, Germany, by sending them six tickets to come to the United States. One of those rescued was his nephew, Henry Stern, who continues to live in Opelika today. In Germany, Stern’s family had owned land where enthusiastic Zionists came to learn how to farm before moving to Palestine. Stern, who doesn’t speak German or Yiddish, calls himself a “redneck from Alabama.” He came to Opelika as a six-year old and learned English from the Sears Roebuck catalogue. Opelika was always a small Jewish community. In 1878, an estimated 32 Jews lived in town; by 1937, 25 did. These small numbers precluded them from forming a congregation, though Opelika Jews did work to maintain their religious traditions. Many of the Jewish merchants in town would close their stores on Saturday, in observance of the Jewish Sabbath. These families worshiped in Columbus, Georgia. The more Reform families traveled to West Point, Georgia, for services. In 2008, there were five Jewish families living in Opelika. Until 1989, Auburn and Opelika’s Jewish families traveled to Columbus, Georgia, and Montgomery, Alabama, for services and religious school. This traveling took its toll. The time change between Auburn, located in the central time zone, and Columbus, in the eastern time zone, made going to synagogue there even more difficult. Mike Friedman summed up the difficulties inherent in having to travel to another town to worship and educate your children when he said, “it is very hard to become part of a Jewish community that you don’t live in.” For these reasons, Jews in Lee County began to discuss forming their own congregation. This effort began in 1981 when Steve and Linda Silvern decided to have a potluck dinner in preparation for Rosh Hashanah. They invited four of their friends and told them to extend the invitation to everyone they knew. What had seemed like a very small and isolated Jewish community turned out to be much bigger than anyone had realized. Eighty people turned out for that first potluck and one hundred turned out the following year. People were surprised that there were so many Jews; everybody had assumed that they were one of the only Jews in the area. At the first potluck, people began to discuss organizing and uniting the Auburn and Opelika Jewish communities. The Silverns put out sign-up sheets and guests noted interest in Israeli dancing, Hebrew language classes, religious school and a Jewish book club. Participants in the first potluck expressed concern over the education of Auburn’s Jewish children. Soon after, Linda and Steve Silvern began teaching Sunday school in their basement with the intention of boosting the students’ Jewish identity in a fun way. In its first year, the school had 11 students, ages five to 12. The Silverns taught Sunday school for 18 years. To strengthen the curriculum, Ray and Richard Zalik began teaching Hebrew classes. The Rosh Hashanah potluck became an annual tradition in addition to yearly community Passover seders. The Silverns described the Auburn Jewish community in those days as an “eating and drinking society.” By 1988, the group began talking about creating a congregation. Opinion was mixed on the subject. The Silverns were initially opposed to the idea because of the level of organization it would take. Many Opelika Jews were opposed as well because their religion was a private matter and they preferred to keep their Judaism more quiet. A core of 40 people met regularly to talk about the possibility of forming a congregation. Finally, on May 20th, 1989, the group founded Lee County’s first Jewish congregation. Marge Hirth was elected the first president. After much discussion over whether their name should be in Hebrew or English, a compromise was made, and the group named themselves “Beth Shalom Jewish Community of East Alabama.” During its first year, the congregation hired Rabbi Sol Landau from Miami, Florida. Although Landau only stayed in Auburn for one year, he made a large impact on the Auburn community, both Jewish and Christian alike. The Christian community embraced the new congregation in Auburn. They had their own questions about Judaism and were excited that the Jewish community finally had a public face. For its first three years, the congregation worshiped in space rented from the First Presbyterian Church. The ark came from Fort Benning, Georgia while the Torah came from Demopolis, Alabama. 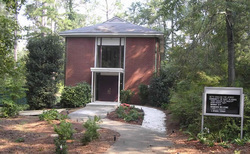 Before they had acquired their own Torah, Beth Shalom borrowed one from Columbus, Georgia. Harriet Friedman remembers wheeling the ark on roller skates out of the church closet, where it was kept during the week, into their meeting room. For the High Holidays, the congregation could not fit into the small room they used at the church, so they held services in the Auburn University Chapel. After Rabbi Landau returned to Miami, John Rosenblatt, a retired military rabbi, spent several months as spiritual leader of the congregation. He left in 1991. Steve Silvern took over as lay leader and continued directing the Sunday school. Silvern led Friday night and Saturday morning services as well as High Holiday services. He served as the spiritual leader of Beth Shalom for the next several years. A professor of early childhood education at Auburn University, Silvern studied for his rabbinic ordination from the Renewal Movement during the summer months. He led the congregation until 2004; since, Beth Shalom has used a variety of visiting or retired rabbis, often from nearby Atlanta. The strain of sharing space with the First Presbyterian Church eventually led the congregation to look for a new building. Praying became particularly difficult around Christmas time when the building would be filled with holiday symbols. Beth Shalom eventually bought an old Christian Science church. Congregants came together to build the bima. The congregation dedicated the synagogue during a ceremony on November 15th, 1992. Rabbi Len Muroff from Shearith Israel in Columbus, Georgia, Rabbi Sol Landau, and Rev. Daryl Lauber, a pastor at the Village Christian Church in Auburn, all participated in the ceremony. Until recently, Beth Shalom, which has used multiple prayer books, resisted affiliating with a specific Jewish movement. When the community was first formed, congregants were worried that affiliating with a national movement would divide them since its members came from diverse Jewish backgrounds. The substantial cost of affiliation was also a concern. Eventually though, the congregation affiliated with the Reform movement. Since there are several intermarried couples in the congregation, most members felt that a Reform affiliation makes the most sense. The building of the synagogue proved to have a positive effect on the Jewish community of Auburn and Opelika. People were more willing to come to services and events because the community now had a public face and a permanent address. In 2005 the synagogue was renovated and a rededication took place in September. 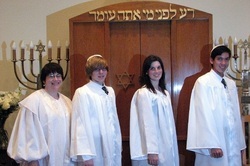 On June 8th, 2008, Beth Shalom held its first confirmation ceremony, officiated by Rabbi Batsheva Appel of the Goldring/Woldenberg Institute of Southern Jewish Life. Although Beth Shalom is a small congregation without a full-time rabbi, it is extremely vibrant, with weekly services and torah study, an active Jewish book group, as well as a thriving religious school. Beth Shalom has benefited from a close association with the Hillel at Auburn University. In 2008, there were about 50 Jewish students enrolled there; with a small but active Hillel that brings together graduate and undergraduate students as well as faculty and staff. Several Auburn students have taught in Beth Shalom’s religious school. While Opelika and Auburn will likely never become a major center of Jewish life, the community's efforts to celebrate and practice their Jewish faith together, along with the presence of Auburn University, keeps the Jewish community of Lee County strong and active.